Piracy is not the most popular profession for witches and wizards, but for those that did do it during the 16th through 18th centuries, they became some of the most famous pirates of all time. While robbing muggle ships or fighting Muggle crews was not a popular choice for wizarding pirates, finding long lost treasure was a huge appeal for them. Some wizarding families would hide their ancient treasures on remote islands or deep at sea, which wizarding pirates would then try to get. The reason Muggle pirates could not reach these treasures is because they were often enchanted and surrounded by curses that no Muggle could possibly get past. The most famed story of wizarding pirates is about some aztec gold, The Black Pearl, Captain Jack Sparrow, and Captain Barbossa. Muggles across the globe have heard of these Captains and the treasure that they sought, but all of them to actually be non-magical individuals that happened to do these incredible feat. So if you happened to hear about the muggle version of the story - you’ve only heard half of it. The Aztecs were an old wizarding civilization that had incredible wealth and incredibly magical power. No one knows exactly why this wizarding community disappeared, but legend always had it that they had left a lot of gold waiting to be found, but that it was very hard to get to and was shrouded with curses. Captain Jack Sparrow wanted to get this fabled treasure, and gathered together a crew of wizards to do so. Captain Sparrow figured out where the treasure was, but entered into a pact with newly joined Barbossa. Once Barbossa had the location of the treasure he marooned Captain Jack Sparrow and took the crew to get the gold. Whether the gold was originally cursed by the Aztecs, or if Captain Sparrow sent a horrible curse after the crew and Captain Barbossa in particular is unclear, but after Barbossa reached the gold, they were all doomed. From then on out none of the members of the crew were truly living, and no magic other than returning the stolen gold would undo this dark magic. 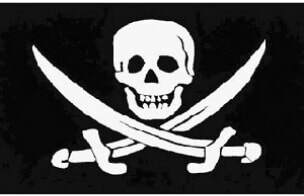 Another wizarding pirate more famed for his ship’s flag than his own works was Captain Calico Jack. John Rackman was nicknamed to Calico Jack because of the color shirts and pants he wore that were made out of calico. On Calico Jack’s ship The Jolly Roger, it had a flag with a human skull on it and two wands crossed under it, but to muggles these looked like swords. In addition to this iconic flag, he also allowed two witches on board his ship - which was generally considered bad luck. One was his wife Anne Bonny and the other was Mary Read (disguised as wizard Mark Read at the time). Despite having two witches on board he was a very successful pirate and plundered for a few years before being publicly hung for all to see. Calico Jack’s remained were kept with a sign of “Pirates, Ye Be Warned!” to hang as a warning to all hopeful to follow in his footsteps. Mary Read was a pirating witch since she joined a Man-o-War ship at the age of thirteen. It wasn’t until John Rackman captured the ship that she was working on that she became a part of his pirating crew. Another infamous wizard pirate was Edward Teach, often called “Blackbeard.” Blackbeard was considered one of the meanest pirates to ever sail the seas ever since he started piracy at a young age. In addition to his fitting long, black beard, Teach also wore very luxurious looking clothes which made him look very formidable. When he went into battle, Blackbeard would stick lighted matches on his hat and in his beard to look formidable, and especially to frighten any Muggles that might be on board. In 1717, Blackbeard put an Imperius curse on a captain of a large French merchant ship and got the captain to get the entire crew to leave the ship without a fight. Blackbeard and his crew then boated what he rechristened to be Queen Anne’s Revenge and turned it into a powerful fighting ship with over 40 cannons on board. It wasn’t until Alexander Spotswood, an American wizard, challenged him to a duel that he was defeated. Blackbeard was hit with over 25 hexes, but didn’t fall until he was actually clubbed over the head by Spotswood. After his defeat, Spotswood was considered the greatest American duelist of his time. The last wizarding pirate we will study was Bartholemew Roberts, known as the “Pirate of Principle.” He is considered the last of the great wizarding pirates before piracy lost its popularity. Roberts was actually a captain of a merchant ship that was captured and wasn’t a pirate until he was elected captain by the pirates on board. Captain Roberts was a very wise wizard and knew how to trick other ships into giving up before they even entered into a fight. He was famed for coming alongside a wizarding treasure ship from Portugal and tricking them into swapping ships with him and sailed away with all of their treasure unharmed completely. Roberts was the originator of wearing a large feather in his hat which became very popular for later pirates to try and imitate. These are certainly not all of the wizarding pirates of old, but this includes the most popular of them! They not only shaped the path for pirates both muggle and magical, but have left behind a legacy of adventure and wonder for everyone to hear about.